It has been over 125 years since the birth of cinema, but the buzz and awe surrounding it has not faded one bit. From being an iconic creation for simple recreational purposes, movies have transcended into this multi-billion-dollar industry influencing the life of a common man in more ways than you could ever imagine. With thousands of films being made every year in multiple languages, movies have become an integral part of our lives and our society. Most of us are huge fans of Hollywood films, but have you ever been intrigued to check out what world cinema has to offer? I am a huge foreign movie buff and every time I watch a Korean film, I get this urge to learn Korean right away. This got me thinking – can someone actually learn a new language by watching movies? And as I took to Google to find the answer to my question, I found out I wasn’t the only one who was toying with the idea of language learning through films (duh!). After all, most people today realize the importance of learning foreign languages. And the internet is filled with tons and tons of resources that talk about cinema as a medium of language learning. And while a few advocated movie based learning, there are many out there who don’t believe in it. Films have been considered a great source of entertainment, but they can also act as a language learning medium if you are prepared to change your perception about it. So how exactly can one learn a foreign tongue by just watching movies? Let’s call the language you want to learn as target language. First, watch loads and loads of movies in the target language you want to learn and create your own list of 12-15 films that you loved. This will take a while but it is the most fun part of the entire learning process. Now comes the hard part – watch these films over and over again and listen intently to the dialogues and narration of the films. When you are watching these foreign language films for the second time, make sure to do away with the subtitles as it will distract you from listening. You need to tune your mind to understand that you’re watching these films to learn a new language and not for gratification or enjoyment. Watch the movie closely, listen intently and repeat the dialogues out loud. Listening, making notes of words and repeating them loudly will help you a great deal with mastering the pronunciation. Keep practicing this exercise of listening and repeating till you get a hang of the diction, tone, inflexions and twang of the language. Look up meanings for each word you pronounce to build your vocabulary. Keep time aside from your daily routine to practice this exercise regularly. Watch, listen and learn from movies every single day so that it is part of your daily routine. Results might take time since it is an extremely slow process. I am two months into this exercise of learning Hindi through films and I have just started to pronounce a few words correctly. But it is the sense of pride of learning these new words on my own with help of movies that is driving me to continue learning every day. Watching my hand-picked favorite Bollywood movies over and over again certainly acts as a source of motivation, too! The biggest benefit of language learning through movies is that you can master any language of your choice without anyone’s help. You can learn the target language even though you don’t live in the country where people speak your target language. If you are a shy person who is afraid of interacting with others in your target language because of the fear of making mistakes, then movie-based language learning might be one of the best options for you. You don’t have to empty your pockets to join language classes. Today, everything is available on the internet, and that does not cost much to use. If I can watch a Hindi or a Korean film for free by sitting in the USA, it means that you don’t have to invest anything but time to learn a language by watching movies. 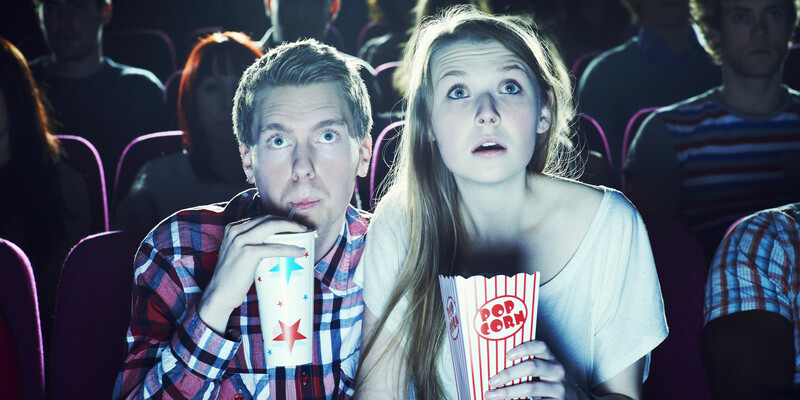 Movie-based learning makes you an incredible listener. You develop an ear for pronunciations, dictions, dialects, etc. You also pick up cool phrases and slangs by watching movies which wouldn’t be possible if you went to a formal tutor to learn a language. What I really like about learning a foreign tongue through movies is that you can control the pace of your learning. You can pause, rewind, fast forward or slow down the movie at will to grasp the language at your own convenience. As I had said earlier, language learning by watching movies is an excruciatingly slow process. It is a test of patience and many give up sooner or later. Many people struggle to keep the entertainment element of the films aside and fail to concentrate on learning the language. At times, I find myself lost in the visuals and the story of the film and it takes a lot of effort to detach from the film itself and concentrate on the learning. There is a fine line between learning from the film you love and being completely immersed in it. One of the biggest problems of learning a language just by watching films is that you never get to use it in real life. Unless you talk to someone in that language and practice using it in public, you would never understand the true meaning of words coming out of your mouth. Feedback from others play key role in language learning. Though this seems like an obvious drawback of this method, it took a rather insightful comment from a well-wisher to make me realize my mistake. I figured out I can’t master a language if I don’t interact with people who know the language. I need to find someone who can speak Hindi with me. I think I might have to get in touch with few Indian folks of my locality to speak better Hindi. There is no defined pattern for learning a new language by watching films. In teacher-driven courses, there is a certain flow in the way you learn. When you learn from experts, you master different learning techniques that help you in grasping a new tongue. But learning through movies doesn’t follow the science behind language fluency and we tend to devise our own styles of learning. And since there is no set pattern or teacher to affirm that we are going in the right direction, self-doubt creeps into our minds and we start to question this way of learning. I have had my doubts in the past, but they fade away as soon as I feel I have made some progress in my learning. To sum it up, the unconventional approach of language learning through movies makes it fairly interesting and entertaining. Just like any other language learning technique, it requires focus, patience and lots of practice to watch movies and learn from it. While you guys figure out if this technique will work for you or not, I will get back to my movie watching spree to master the language of Hindi. Ethan is a dedicated private ESL teacher. Apart from his passion for teaching, Ethan loves to write and holds a degree in creative writing. When he is not teaching or writing his book, Ethan loves to blog and is a huge fan of educational technology. You can check out his blog Essay Writing Tips and Help on WordPress. and the day came when the risk to remain tight in a bud was more painful than the risk it took to open.